Salary Vs. Stress - How do I become a ... ? So, you think it’s cool being a Wall Street hedge fund manager, or a four star General? Well, maybe it is, but it comes at a price: a stress level that few can take for prolonged periods of time. Maybe it would be better, as you consider your life’s path, to take a less stressful route to financial comfort, say, becoming an optometrist, or, if you’re so inclined, a college professor. 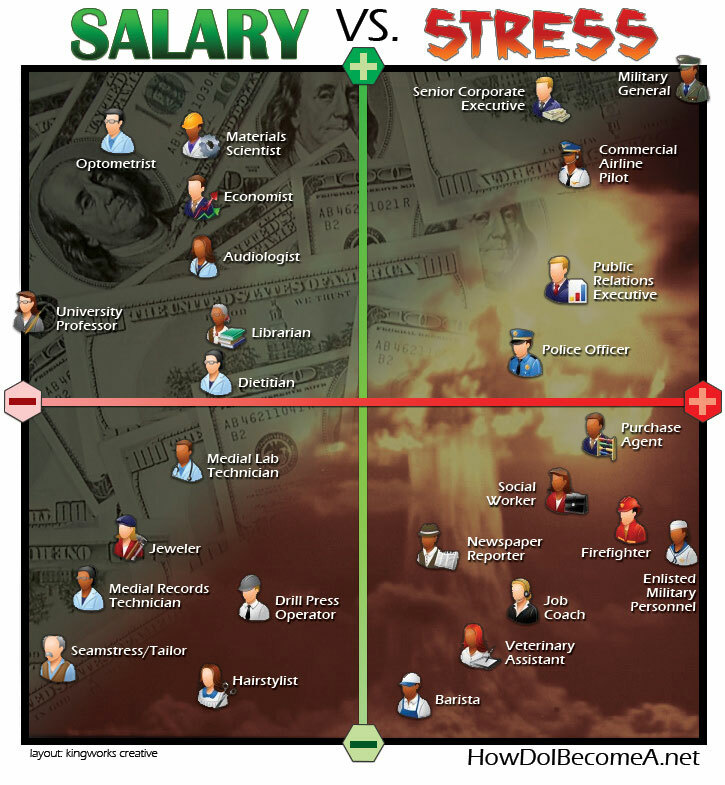 This quadrant gauges the ups and downs of jobs vs. career stress. The idea originated with the Wall Street Journal’s annual best and worst jobs list, which began in 1995. When the WSJ stopped doing it, CareerCast.com picked up the idea. They now rank 200 jobs according to more than 100 criteria and compile lists of least and most stressful jobs. Military Generals are well paid with great perks, but their job involves risks to one’s own life or being responsible for others’ lives. Highly stressful, right? Other jobs on the most stressful list that may seem surprising: public relations executive and senior corporate executive. On the low stress, low pay lower left quad there are jobs like hair stylist and lab technicians. All honorable jobs, but with a lot less stress. So where do you want to fit in?